Nebraska’s match-up with Butler in the NIT will bring a familiar face to Lincoln as former coach Barry Collier, now the athletic director at Butler, will be in the house along with the Bulldogs on Wednesday. Collier spent six season as Nebraska’s coach in the early 2000s, taking the Huskers to two NITs during his time in Lincoln. In 2006, Collier left Nebraska to return to Butler — where he began his head coaching career — as vice president and director of athletics. Hail Varsity Radio’s Chris Schmidt caught up with Collier to discuss Nebraska, Butler, the NIT and more. The Bulldogs finished 16-16 this season and in a tie for last place in the Big East wth a 7-11 conference record. Collier offered his thoughts on what to expect from the Bulldogs. “We’ve been inconsistent to say the least, but when you’re 16-16 I don’t know that there’s any way to get more inconsistent than that,” Collier said. “When we play well, our defense is solid for most of the game. We have guys that are good at taking shots; we don’t always make them, so it’s a challenge to try to get that consistency. We’ve struggled on the road. We’ve played in some real good places against real good teams and had more losses by a large margin than wins. So we know we’re up against it to play the Huskers. They’re even a different team than the team I saw roughly six weeks ago because of Injury to [Isaac] Copeland — that was actually the game I watched was when Isaac Copeland got hurt. Collier stopped by Pinnacle Bank Arena when the Huskers hosted Ohio State on Jan. 26. Butler played at Creighton the day before so Collier took advantage of that road trip to check out his former team. Collier isn’t the only tie between Butler and Nebraska. Assistant coach Michael Lewis spent five seasons as an assistant at Butler before joining Tim Miles’ staff in Lincoln. Collier said he’d make sure to catch up with Lewis before the game. 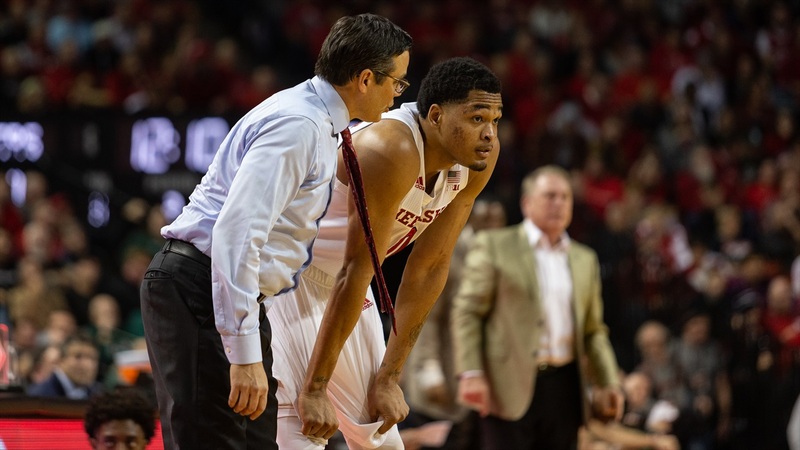 Collier is also a member of the NIT selection committee and he discussed what kind of an impact Nebraska’s run in the Big Ten Tournament made on the Huskers’ selection and seeding for the Tournament. “I did not think there was doubt [about the Huskers making it], and yes, the Big Ten run, the play in the Big Ten, even dropping a close game to Wisconsin was a plus given the success of the teams they played against and their play in the Big Ten Tournament,” Collier said. “There’s no doubt that helped them a great deal. You know what? The NIT committee’s job, like the NCAA committee’s job, is to look at all the games and each one that came in as that tournament was moving along added to their position and there’s a kind of constant update of information from teams when they were playing during that last week of the season and those conference tournaments. Collier spent nine seasons as the coach at Butler, guiding the Bulldogs to a 196-132 overall record. He led the Bulldogs to the NCAA Tournament in three of his last four seasons and took Butler to the NIT three times during his tenure as well. Schmidt asked Collier how he was able to build the foundation of a winning program at Butler. Collier also discussed the challenge of coaching at a school like Nebraska. “I think the most important thing is to focus on the now,” Collier said. “This year’s team, whatever you’re talking about, can’t do anything about what happened five years ago, much less last year but even further back when they weren’t even together as a team. I think there are pieces in place. It takes great time and patience. You look at their recruiting, the recruiting base is wide and far and that makes it a challenge, but if you find people that want the challenge and love the challenge, then places that don’t have everything in terms of recruits base or tradition or something like that, you can overcome that with the right culture and the right people. For the full interview, listen to the latest episode of Hail Varsity Radio. In addition to Collier, Schmidt also talked with the BTN’s Rick Pizzo and Tom Penders.